apparently it’s international waffle day – it also happens to be waffle wednesday. i’d like to say i totally planned this post, but i really had no idea it was such a big day for waffles. over spring break i indulged in the fact that i could make myself an actual breakfast. i hate to admit that i am a horrible breakfast person during the week. most days i won’t eat breakfast (horrible, i know). but for some reason i’m just not hungry first thing in the morning. when i do eat its usually a banana while looking over the schedule for the day (i’m an on-call teacher, so i’m in a new classroom everyday). on the weekends i’ll make a big breakfast/brunch. sure i could wake up earlier and make breakfast, but i cherish my extra 20 minutes of sleep. i’m the person who hits the snooze button once or twice, only because i set my alarm 10 minutes before i actually need to be awake, but i like the pre-wake up call before the wake up call. on mornings when i’m not running out the door i’ll take the extra few minutes to make a green smoothie (try this recipe here, here & here). i don’t eat a lot of cereal, and if i do it’s usually plain rice krispies with almond milk and cinnamon. another favourite is oatmeal on the go – either overnight oats, or oats & cinnamon. 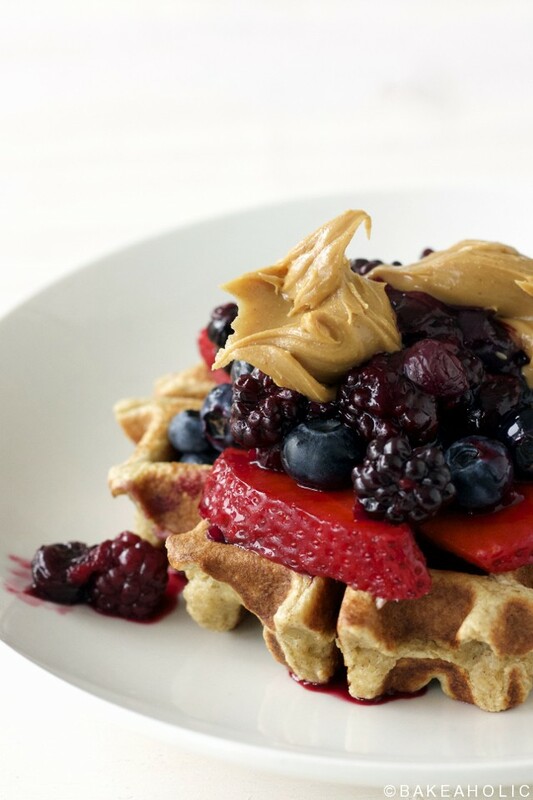 one of my new favourite go-to’s is this blender waffle recipe. 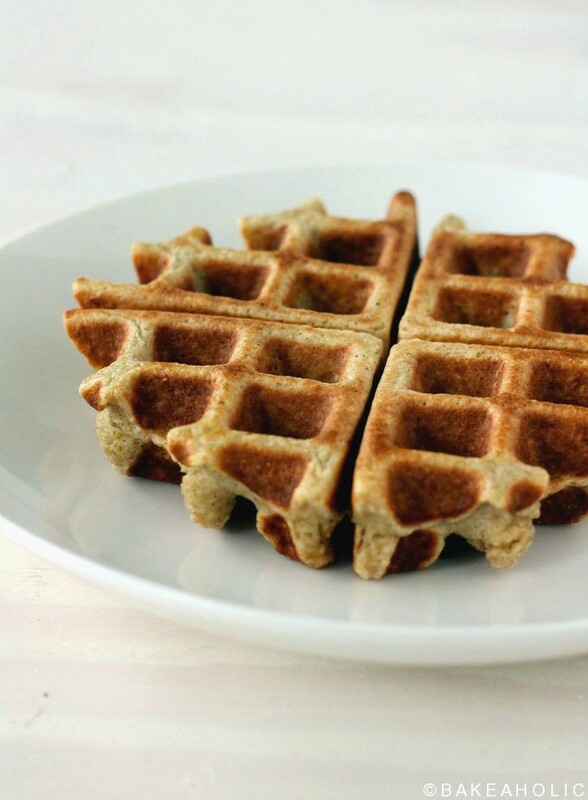 i used to use my food processor to make the waffles, but i recently found that my blender makes even better oat flour than the processor does. then i just tossed in the rest of the ingredients and blend it together. one of my instagram followers asked if i could share the recipe – and to be honest i actually never measure anything for these waffles. i’m more of a recipe-by-feel, or sight, type. i’ll throw in the oats, as much as i think, then add in a banana, some eggs and then a splash of milk. this time, i decided to throw it in, then take it out and measure it so i could post the recipe. the waffles turn out great, with no butter or sugar added. they last a few days in the fridge, and you can definitely make a batch and freeze them for later. 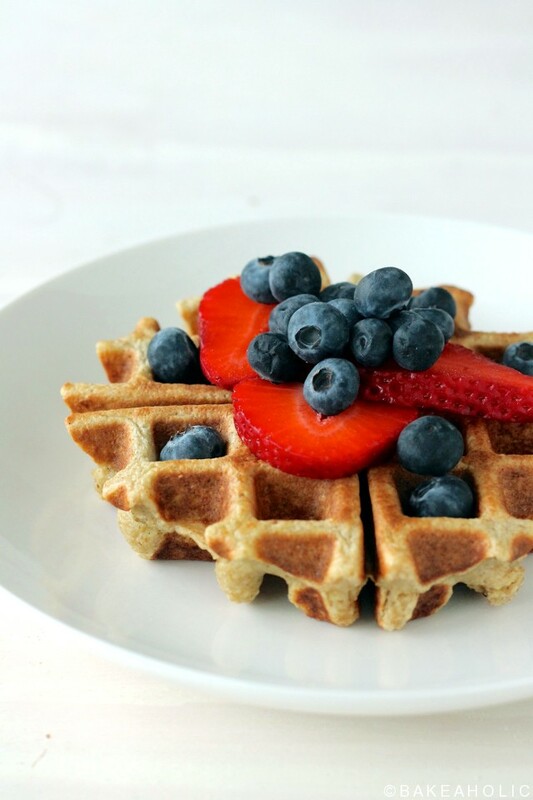 perfect waffles made in a blender without gluten or sugar. in a high powered blender (or food processor), pulse the oats into a flour for 1-2 minutes. add in the banana, almond milk and eggs. blend on low, and increase speed until well blended. you can add in cinnamon, or berries to the batter if you like. pre-heat your waffle iron as per the instructions, and grease with coconut oil or other cooking spray. cook for 3-4 minutes, until cooked through. you'll want to make sure its cooked through otherwise it may stick to the griddle. I have a flip-waffle maker and i like to cook them for 4 minutes for a crispier waffle. top with your favourite toppings. I like to add frozen blueberries to the mix. Instead of syrup, i'll warm up frozen mixed berries. topping with a smear of peanut butter or other nut butter is also delicious. if the batter is too thick, which the oats might soak up the liquid, simply add in more milk.